It works well but requires me to know and input direct URL of archives I want to scan. There are nearly 100 OSGeo mailing lists and sometimes I need to juggle quite many of them. Not much fun. The Nabble comes in handy when I have to do many searches at the same time. I have been using Safari as main Web browser since I moved to Mac OS X - it just runs faster on my PowerBook G4. Shortly, I discovered Inquisitor plugin for Safari and my lists searching practice have changed. Thanks to Inquisitor’s feature of additional search engines, I use it as an interface to the OSGeo mailing lists archives and OSGeo.org. 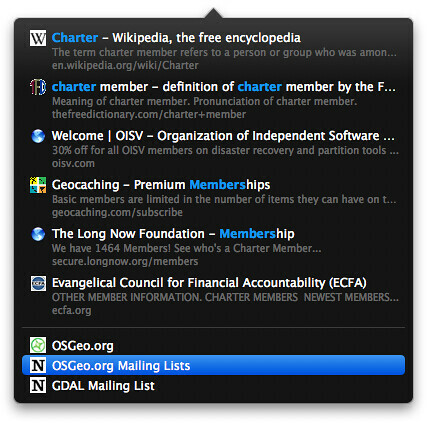 With a very little configuration, the Nabble and OSGeo.org search engines are accessible in the Safari search box and also using keyboard shortcuts. Click on the plus button to Add new custom search shortcut… and input Site Name, search engine URL with query placeholder and optional Shortcut. Notice the %@ part, it is a search query placeholder. Use of the shortcuts is simple, issue Cmd + Option + F to jump to the Google search box in Safari, input a query and use custom keyboard shortcut of desired search engine, for instance I press Cmd + Shift + G to search gdal-dev list. Alternatively, while you type your query, the Inquisitor drops down Spotlight-like box and then use arrow keys to select one of listed search engines.